Flechsig (1920) was the originator of the view that the degree of myelination of the central nervous system might be correlated with functional capacity. In his theory he stated that myelination started in projection pathways before association pathways, in peripheral nerves before central pathways, and in sensory areas before motor ones. Although he did modify his theory slightly because of his critics, he maintained that fibers always myelinated in the same order: first the afferent (sensory), then the efferent (motor), then the association fibers. The histological study of fetal development has confirmed that myelination proceeds systemetically and, in nerve pathways with several neurons, in the order of conduction of the impulse. 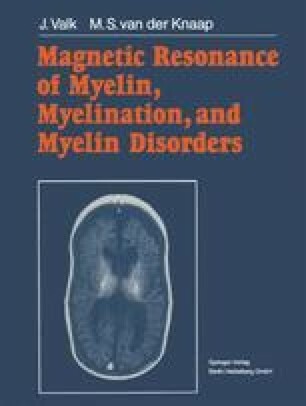 The first signs of myelination appear in the column of Burdach at the gestational age of 16 weeks, growing stronger from the 24th week. The column of Goll starts to myelinate at 23 weeks gestation. Cerebellar tracts start to myelinate at about 20 weeks gestation and the amount of myelin at birth is considerable. Pyramidal tracts start to myelinate at 36 weeks at the level of the pons, but at birth the amount of myelin is still scanty. In other tracts, for example, the rubrospinal tracts, the pattern of the pyramidal tract is followed. The olive and cerebellar connections begin to myelinate by 22 weeks gestation with rapid progression thereafter. In the pons some myelination is present at 36 weeks, but is still slight at birth. The corticopontine-cerebellar tracts are relatively late in myelination and show hardly any myelination at birth. In a full-term neonate of 40 weeks gestation, myelin stains reveal myelin in the medulla oblongata, in the central fibers of the cerebellum, in some fiber tracts in the pons and mesencephalon, in the posterior limb of the internal capsule, and some in the basal nuclei, spreading from there to the central parts of the centrum semiovale into the postcentral gyms. For further details see chapter 3.4.